Penned by the legendary Jerry Leiber and Mike Stoller, "Jailhouse Rock" became another No. 1 record for Elvis. It entered the British charts at No. 1, making it the first single ever to do so. 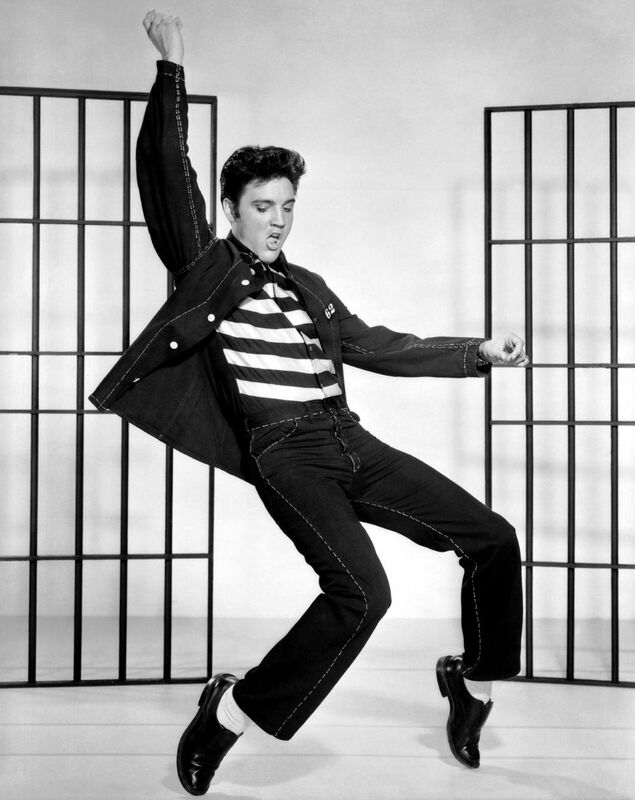 The rock 'n' roll songwriting duo was commissioned to write most of the songs for the movie Jailhouse Rock, though they were less than enthusiastic about the assignment. Prior to "Jailhouse Rock," Elvis had recorded a handful of songs from Leiber and Stoller, including "Hound Dog," "Love Me," and a couple of tunes from Loving You. The two songwriters were not impressed with Elvis' interpretation of their material. Leiber and Stoller had a tendency to write hard-driving, R&B-flavored tunes with satiric or tongue-in-cheek lyrics that could be understood at more than one level. Elvis, on the other hand, performed most of his material straight, as when he recorded the duo's "Love Me," which they had originally intended as a lampoon of country-western music. 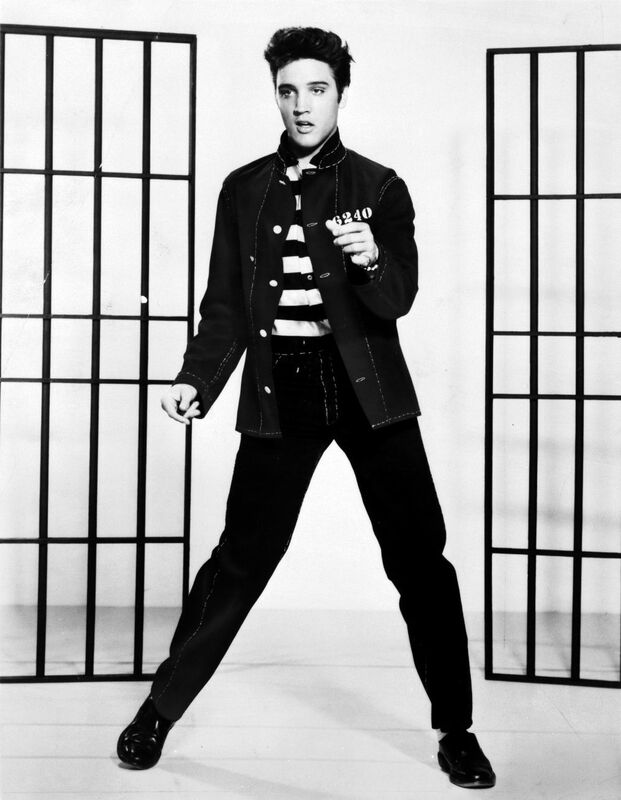 Leiber and Stoller also felt that Elvis' foray into R&B territory was a fluke, and they were suspicious of his interest in blues and rhythm-and-blues. The short period of time that Leiber and Stoller worked with Elvis proved beneficial to both sides. The irony and ambiguity in the lyrics of "Jailhouse Rock" gave Elvis one of his most clever rockers, while the singer's sincere and energetic delivery prevented the song from becoming too much of a burlesque -- a tendency with some of the Leiber and Stoller songs written for the Coasters. These songwriters hung with Elvis long enough to contribute to the King Creole soundtrack, among other projects, but eventually they ran afoul of Elvis' management for trying to introduce him to new challenges. 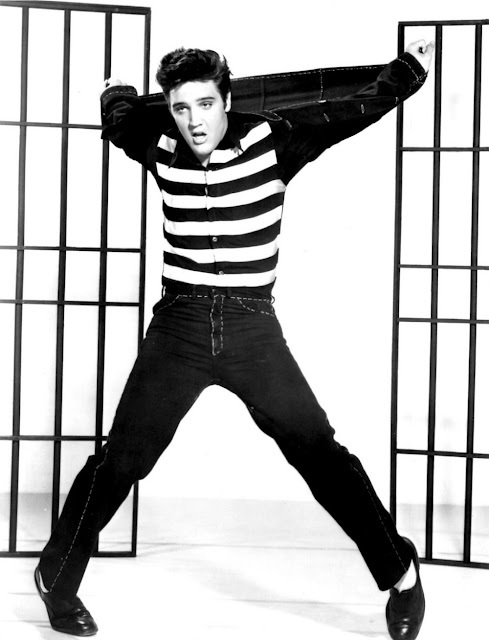 With its combination of hard-rocking tunes and romantic ballads, the Jailhouse Rock EP ably supported the film of the same title. King Creole boasts a powerful cast and a skilled director, and Blue Hawaii features slick production values, but the gritty, low-budget Jailhouse Rock remains Elvis Presley's best film. 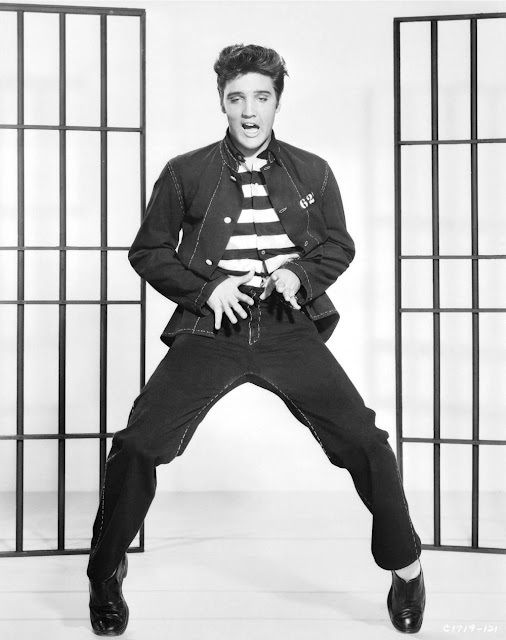 If Elvis the rock 'n' roll rebel liberated a generation from the values, tastes, and ideals of their parents, then Jailhouse Rock is the only Presley film that speaks directly to the feral, sensual, and unruly nature of rock 'n' roll music. 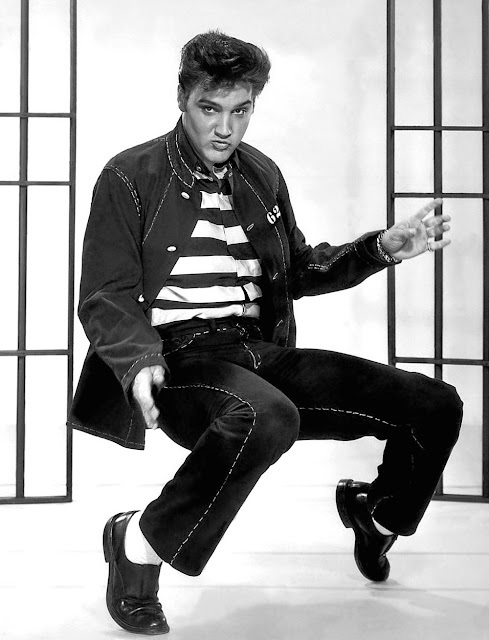 Elvis' musicals belong to that genre known as the "teenpic" or the teen musical, in which rock 'n' roll performers were showcased in musical vehicles designed to cash in on the immense popularity of youth-oriented music. From Rock Around the Clock, featuring real-life rocker Bill Haley, to Rock, Pretty Baby, starring actors pantomiming to ersatz rock tunes, producers and studios pandered to the teenage audience by combining teen fashion, teen jargon, and teen idols with a healthy dose of generational conflict. 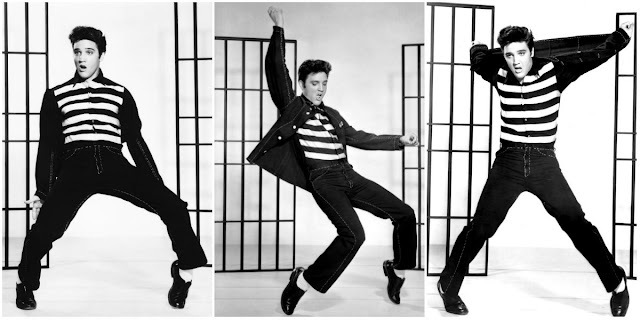 Released in 1957, Jailhouse Rock offers more than a superficial rundown of the latest fads and fashions, however, and it excludes the standard clash between generations. The plot features an insider's look at the rock 'n' roll record business (as interpreted by Hollywood) through the character of Peggy Van Alden, a record exploitation "man" (1950s title for a record promoter) who helps ex-con Vince Everett (Elvis' character) launch a singing career. Because the audience sees the business through Peggy's point of view, the film's treatment of rock music differs from other teenpics. For example, rock 'n' roll is an established, accepted style of music when the story begins, and there is no organized resistance to it by authority figures. In general, the attitude toward the music in the script is both knowing and respectful, serving to validate rock 'n' roll as a popular art form -- an important consideration to teenagers of the era.